Steve Haeseker, the U.S. Fish and Wildlife Service biologist who led the CSS spill analysis that some regional groups are using to push for a years-long test at federal dams, made his own case for the test at the Sept. 10 meeting of the Northwest Power and Conservation Council in Coeur d'Alene, Idaho. 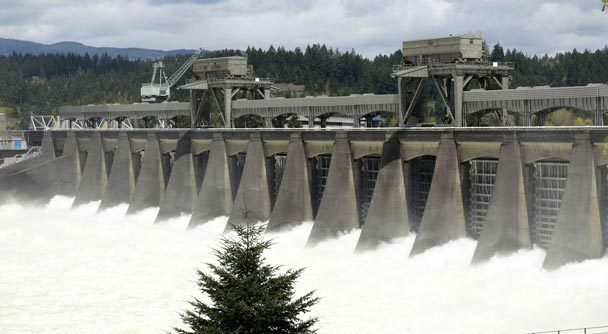 Haeseker said his analysis showed that more spill at federal dams (raising it to 125 percent TDG levels in tailraces) could boost ESA-listed salmon and steelhead to recovery level return rates. The analysis was not very convincing to federal scientists, who explained their concerns in the new draft BiOp. After his presentation, Washington Council member Tom Karier echoed some of the same concerns over possible spurious correlations that National Marine Fisheries Service mentioned in its draft BiOp (See previous story). Karier also wondered if the inclusion of 2001 survival data influenced Haeseker's results, and whether low levels of spill may correlate with higher survival, but may not at higher levels of spill. The extremely low flows and almost no spill that year made for almost no survival of inriver migrants from the Snake. "When you look at just spill v. SARs, it appears there's a lot of things going on, and there are," said Haeseker. "But when you account for all those other things, at the same time, you're able to explain a lot of that variability--and spill is consistently a major driver in that." He said he hasn't yet conducted an analysis to see how sensitive his results are to the inclusion or not of the 2001 data. Margaret Filardo from the Fish Passage Center assured the Council that any ill effects to juvenile salmon from 125-percent TDG levels could be found from effective monitoring, and risks reduced if necessary, but she was not sure what affects those levels might have on other aquatic species in the rivers, especially those that inhabited shallow waters. The state of Oregon has recommended the 125-percent spill test as an amendment to the region's fish and wildlife program. Amendments were due at the NPCC by Sept. 17. Any spill test would likely last for many years, which would mean even fewer fish would be barged than are now. NOAA's latest draft BiOp has addressed the agency's concerns over this issue and it calls for barging juvenile fish to begin as early as April 21 to split inriver and barged fish more evenly, as the region's independent science panel had recommended for the time being. The draft BiOp points out that since 2006, spring Chinook and especially steelhead barged from the lower Snake have had better SARs than inriver migrating fish, but lower percentages have been barged than in previous years. In 2012, only about 23 percent of wild spring Chinook and 28 percent of wild steelhead were barged, according to the draft BiOp, but benefits to the barged fish have not been insignificant. The BiOp reported that between 2006 and 2009, average adult returns of barged wild spring Chinook ranged 34 percent to 77 percent better than for fish bypassed at collector dams, and 44 percent to 289 percent better for barged wild steelhead compared to bypassed ones. Another presentation at the Council meeting by Canadian researcher David Welch led to some discussion of a recent paper he co-authored that was published online in the April 1 Proceedings of the National Academy of Sciences. The study found no evidence of reduced survival for barged fish or fish that passed more dams, using data from his acoustic-tagging project. He speculated that lower returns of Snake River fish compared to those from fish that encountered fewer dams may mean they go to different places in the North Pacific where survival rates are different, rather than pinning the blame on more dam passage. "Don't confound the effects of the ocean and the hydropower system," he told the Council. "You need to do things you're obligated by law to do, but make sure that it's the right thing, not based on a supposition, or a hidden assumption, or a correlation," Welch said. "You need the information to disassociate what's a hydropower effect from what's an ocean effect. And that's why I've always argued that there is a nexus between what happens in the ocean and what happens here. "A tremendous amount of effort and focus has been spent at the Council and [by] lots of biologists looking at delayed mortality and the barging issue. Why haven't they been more successful? Well, we think we have a simple answer--the survival's about the same out in the ocean. You're not going to get a benefit--a big benefit." Nonrepresentative fish and ocean migration assumptions confound inferences in Rechisky et al. Close examination of the methods, assump- tions, and results of Rechisky et al. (1) in- dicate that their results are confounded by nonrepresentative tagging, rearing, and re- lease factors, and that critical assumptions are inconsistent with available data. Thus, the authors' conclusions regarding hydro- system-related delayed mortality are over- reaching and unsupportable. Nonrepresentative fish with acoustic tags were 10-20 mm longer, were released 21-83 d later, and were released 55-249 rkm further downriver than their corresponding hatchery populations of inference. Length at tagging, timing of release (2), and migration distance have all been shown to influence survival rates of Chinook salmon at multiple life stages. Any of these factors alone confound comparisons with the populations of infer- ence, let alone the combination of all three. Rechisky et al. (1) report that estimation of detection probabilities for the Lippy Point subarray was not possible because of too few detections of tagged smolts at the distant Alaska subarray. This assumption weakens the reliability of survival estimates used to draw conclusions concerning delayed mor- tality. The sensitivity analysis used to explore the effects of alternative assumptions is narrow in view of the large uncertainty in detection probability. Rechisky et al. (1) assume that all fish mi- grated North on the continental shelf at depths shallower than 200 m and through the Lippy Point subarray. If this assumption is not valid, the reported survival estimates will be biased low. Studies by McMichael et al. (3) and Schreck et al. (4) indicate that this assumption is likely violated. The de- gree of bias is unknown. Contrary to Rechisky et al. (1), in-river survival varies between 25% and 83% and is influenced by hydrosystem conditions (2). Ocean survival rates and smolt-to-adult sur- vival rates are also influenced by hydrosystem conditions (2, 5). These studies demonstrate that hydrosystem management actions influ- ence survival at multiple life stages. Rechisky et al. (1) found no evidence that Snake River hatchery Chinook smolts expe- rienced lower survival rates in the early ocean than those from the Yakima River that mi- grated through fewer dams. The authors ac- knowledge these estimates represented tagged groups whose size, holding, and timing of release had been significantly manipulated to accommodate acoustic tags. As a result, tagged fish were not representative of the hatchery populations of inference. Simi- larly, the size-distribution of the hatchery study fish was larger than all but a small fraction of the wild individuals, concurrent with differences in migration timing between study fish and wild fish. The study was short term (3 y) and the migration conditions that study fish experienced were different from migration conditions experienced by most wild and hatchery fish. Because of low sample sizes and poor detection efficiency, untested, critical assumptions about detection proba- bilities and ocean migration patterns were required. Thus, the findings of Rechisky et al. on delayed hydrosystem mortality for wild or hatchery fish are highly questionable.